A&B Business :: How You Can Reduce Winter Fire Hazards In The Office This Season? How You Can Reduce Winter Fire Hazards In The Office This Season? Whether you're working at home or in the office, there's an increased risk of fire during the winter months. This is because of heating, holiday decorations, electrical issues, and carbon monoxide risks. To help you and your employees stay safe this winter (and to keep your office in one piece) here are a few ways you can reduce fire hazards in your workplace this season. Many fires during the winter months are caused by electrical system failures and appliance defects. Oftentimes, these failures are caused either by poor maintenance or misuse. The winter months call for an increase in lighting, heating, and appliance use. If your office is using too many printers, copiers, and other electrical appliances, it could potentially overload your circuits during the winter months and pose a fire hazard. Consider optimizing your printers and copiers using managed printing services. Managed printing services give you greater control over what's printed and who's printing so you can improve the efficiency of your copiers and reduce paper waste. The second leading cause of U.S. home fires, injuries, and deaths during the winter months is heating. It's important to keep objects that are flammable away from heating systems. This is especially true of space heaters, which are most often involved in heating equipment fires. That said, make sure your HVAC system is regularly maintained to ensure your employees don't need to use space heaters in their offices or elsewhere. Paper waste and unorganized documents can be a major issue during the winter months. In the event of a fire, this paper can easily feed the flames and increase fire damage throughout your office. Consider making a clean desk policy during the winter months and reducing how much you and your employees print. Up to 17% of everything printed is considered waste. Do your printing devices and services need an upgrade? 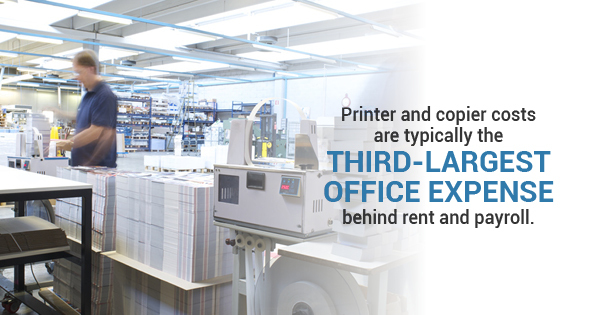 Printer and copier costs are the third-largest workplace expense just behind rent and payroll. If your printing devices and services aren't up-to-date, they could be hiking up your utility bills and creating more paper waste. A and B Business Services offers managed printing services to help you make your printing devices and services more energy-efficient by giving you greater control over your devices. To learn more about managed printing solutions and how they can help your business, contact A and B Business Solutions today.